Indiana University senior football manager Matt Stauder was dealt a double blow. In September 2017, his father, Marty Stauder, died suddenly of a heart attack at age 57. Earlier this year, Stauder was diagnosed with Hodgkins lymphoma. The 2015 Guerin Catholic High School graduate from Westfield began cancer treatment in May and finished his 12 chemotherapy sessions in October. He learned in early November that his cancer was in remission. He will have a blood test in three months. Stauder was recently named a weekly nominee for the 2018 Capital One Orange Bowl-Football Writers Association of America Courage Award. “It’s an honor and privilege to be nominated for the Courage Award and it’s humbling at the same time,” Stauder said. Stauder would commute to Indianapolis to have his treatments once every two weeks. Through it all, he kept up his manager duties. Fifth-year senior running back Ricky Brookins spearheaded a GoFundMe page under Stauder’s name, which has raised nearly $32,000 as of Nov. 13. The goal is $35,000. In his manager role, Stauder works closely with running backs coach Mike Hart and his unit. Stauder, in his third year as manager, will graduate in May 2019 with a sports management and marketing degree. 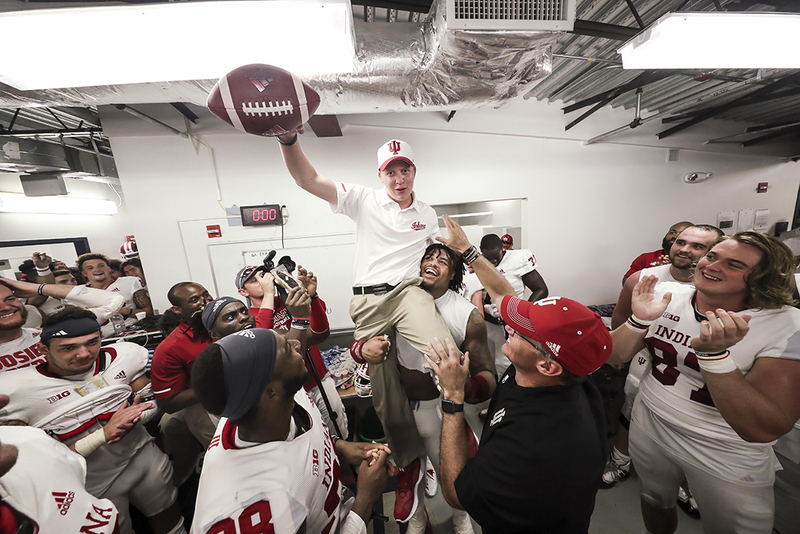 Stauder received the IU game ball from Hoosiers’ coach Tom Allen after the season-opening victory Sept. 1 at Florida International. The game was played on the one-year anniversary of his father’s death. “The game ball is the greatest honor I’ve received,” said Stauder, who played basketball and baseball at Guerin but hasn’t played football since eighth grade. Requirements for nomination include displaying courage on or off the field, including overcoming an injury or physical disability, preventing a disaster or living through hardship. The winner of the award will be included in festivities during Orange Bowl week and receive a trophy during an on-field presentation.